This composite image combines EIT images from three wavelengths (171Å, 195Å and 284Å) into one that reveals solar features unique to each wavelength. Since the EIT images come to us from the spacecraft in black and white, they are color coded for easy identification. 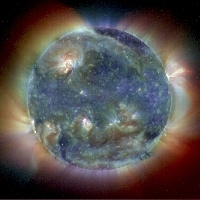 For this image, the nearly simultaneous images from May 1998 were each given a color code (red, yellow and blue) and merged into one.